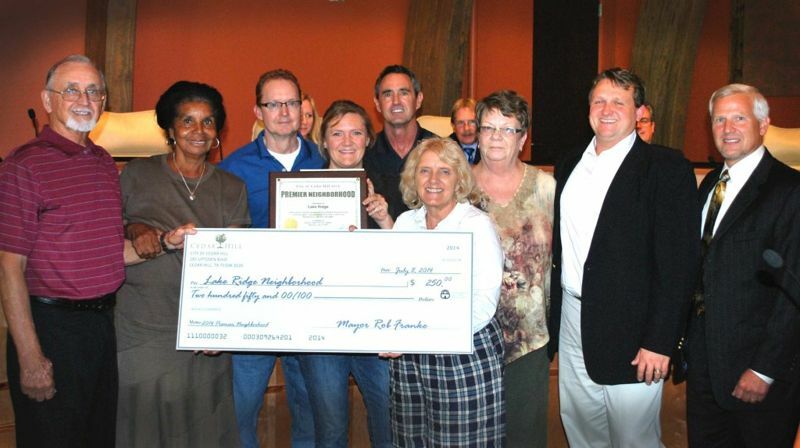 Lake Ridge was recognized for having one of the City’s most effective property owners associations and excelling in community activities that include organizing an annual charity golf tournament to raise money for local area charities; neighborhood watch meetings; celebrating National Night Out; and lending their support to numerous city, police, fire and recreation activities and events. The Lake Ridge property owner association is led by President and property owner Chad McCurdy and Association Manager Carolyn Rollwitz, as well as the POA Board Members. Nestled among rolling hills reminiscent of the Texas Hill Country, Lake Ridge at Joe Pool Lake offers a unique landscape unlike any other in DFW with panoramic lake and skyline views. The community features gated and non-gated neighborhoods with spacious half to 1+ acre wooded and lake view homesites. Residents enjoy the benefits of the neighboring Tangle Ridge Golf Club, Lynn Creek Marina and over 200 acres of community parks, walking trails and fishing ponds. Centrally located just 20 minutes from Downtown Dallas and 28 miles from Downtown Fort Worth, residents in Lake Ridge are within a short commute to the attractions of both Metroplex downtowns. For more information on Lake Ridge, visit www.lakeridge.net. About SouthStar Communities SouthStar Communities is a fully integrated real estate investment, development and management firm focused on the residential marketplace. Based in Austin Texas, SouthStar has been creating healthy communities and a legacy of success throughout the Southern United States for a generation. Since its inception in 1999, SouthStar has acquired and developed residential assets valued in excess of $2.5 billion. The company continues to seek opportunities to leverage its experienced team and processes to deliver great experiences for owners and strong financial results for its portfolio partners. For more information, visit www.southstarcommunities.com.